When you cosign a loan, you promise to pay off somebody else's debt if the borrower stops making payments for any reason. This is a generous act, as it can help a friend or family member get approved for a loan that they otherwise wouldn’t qualify for. But it’s also risky to guarantee a loan for somebody else, so only do it when the situation is right. When you cosign a loan, you and the borrower complete a loan application, and you agree to pay off the loan. The application may be online or on paper, and you sign the application to take on that responsibility. A cosigner helps a borrower get approved. Some borrowers are unable to qualify for a loan on their own: They don’t have enough income to cover the loan payments, or their credit scores may be too low. In some cases, credit disqualifies them because of problems in the past, while others lack a sufficient borrowing history. Cosigners typically have enough income and sufficient credit scores to strengthen the loan application. With the cosigner involved, lenders may decide to approve an application. It’s great to help somebody get a loan, but it’s critical to understand the risks before doing so. There’s a reason the lender wants a cosigner: The lender isn’t confident that the primary borrower can repay in full and on-time. If a professional lender isn’t comfortable with the borrower, you’d better have a good reason for taking the risk. Lenders have access to data and extensive experience working with borrowers. Damage to your credit: If the borrower does not repay the loan as agreed, your credit suffers along with the primary borrower’s credit. Late and missed payments appear on your credit reports, and your credit scores will fall. As a result, it gets harder for you to get loans, and there may be other consequences (like higher insurance rates). You’re 100 percent responsible: If you agree to cover the loan payments, lenders will expect you to come up with the required payments. Plus, you may face late fees on top of those monthly payments. It doesn’t matter if the borrower has more money than you do—the lender collects wherever possible, and they take the path of least resistance. You agree to put yourself into the mix when you cosign, and it might be easier to get funds from you. It also doesn’t matter why the borrower isn’t paying: They might lose a job, pass away, become disabled, or simply disappear. You’ll get calls and letters from lenders (and eventually debt collectors), and you may even have legal judgments against you. Legal judgments: If you don’t make payments, lenders may bring legal action against you. Those attempts to collect also appear on your credit reports and do further damage. What’s more, lenders may be able to garnish your wages and take assets from your bank account if you don’t willingly make payments. This is not a risk to be taken lightly. Reduced ability to borrow: When you cosign a loan, other lenders see that you are responsible for the loan. As a result, they assume that you’ll be the one making payments. Cosigning reduces the amount of your monthly income that is available to make payments on new loans. Even though you’re not borrowing—and even if you never have to make a single payment on the loans you cosign for—it’s harder for you to qualify for the loans you need. This can prevent you from buying a home or automobile when you need one. No easy out: When you cosign, you enter into a long-term relationship. Lenders are reluctant to let you off of the loan. Why would they, when they have two (or more) people to collect from instead of just one? It is possible to remove yourself from the loan (or get a cosigner release) in some cases, but this doesn’t always work the way you’d hope. When you cosign, you become responsible for the debt—that’s it. You don’t own whatever the borrower buys, and you have no right to the property just because you cosign. 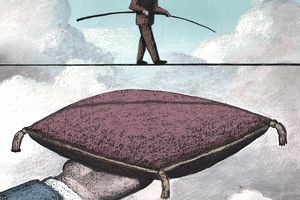 If a borrower stops making payments, there might (in the right situation) be convoluted legal procedures you can follow to regain some of what you lose, but don’t get your hopes up. What’s more, the time and energy you spend will be gone for good. If you’re not into taking risk, avoid cosigning. It’s hard to claim that cosigning never makes sense. It’s risky, but it’s your life. You need to evaluate the risks and decide what to do. You can afford the risk: If you can afford to take the risk and you just want to do it, then it may make sense to cosign. This might be the case if you have plenty of extra cash flow and substantial assets available to pay off a loan if your borrower defaults. Still, it’s essential to verify that you can qualify for any potential borrowing that might be in your future—you need enough income and assets to get approved. Remember that you might be able to afford the risk now, but you need to be able to absorb losses at an unknown time in the future, as well. You’re in it together: If you’re truly borrowing with somebody, it could make more sense to cosign. For example, you might be buying a car that will be part of your household, and your partner needs a little boost to get approved. That said, it might be better to be a co-owner of the car and apply for the loan jointly. You want to help (and there are no other options): In some cases, people just want to help somebody else, come what may. Again, you’re taking substantial risks when you cosign, but you may be willing to take those risks. Sometimes things work out fine—but you need to be prepared for things to go badly. Before you cosign, evaluate the alternatives. Get creative and identify several options that accomplish what everybody needs—while keeping everybody safe. From there, pick the best one. A few ideas to get you started are below. Help with down payment: Instead of cosigning so that lenders approve your borrower, help out with a down payment instead. A bigger down payment could result in lower required monthly payments—making it easier for the borrower to qualify with limited income. Obviously, you need to have substantial cash on hand, you need to be willing to lose that money, and you need to communicate about how to handle that down payment. Discuss whether or not you’re making a gift, and if you need to set up a formal private loan agreement (and check with your CPA and attorney to identify any issues). Lend: Speaking of private loans, you can lend the money yourself if there’s a high risk of default (again, assuming you can afford to lose the money). Make sure you communicate clearly about expectations and get the agreement in writing. A private loan—where you are the bank—is another way to help somebody. However, these loans can make things awkward and ruin relationships, and it might be hard for the borrower to build credit unless you report payments to credit bureaus. If you decide that cosigning makes sense for you, manage the risks to protect yourself and your relationship. Don't be surprised if you have to pay: The Federal Trade Commission (FTC) once reported that as many as 75 percent of cosigners have to make a payment for somebody else. Communicate: Communication is harmony. Stay in close contact with the primary borrower, and encourage communication early and often. Get info: Make sure you’ll have access to the loan information and payment history. Request that the lender inform you of any late payments—a letter is great, but sign up for text or email alerts if possible. Keep current: If the borrower starts missing payments, try to keep the loan current to avoid damage to your credit. To do so, make the payments yourself. This isn’t what you want to do, but it’s what you’ve agreed to. Of course, you’ll also want to find out what’s going on with the borrower and get them back on track. Manage the risk: When the goal is simply to help somebody build credit, manage your risk by keeping the loan small and short-term. If it’s a loan you can easily pay off, there’s less to worry about. And a loan that’s due within a year or so means you can limit the time and energy it takes to keep track of the loan. Get released: Some loans allow a cosigner to be released after the borrower meets certain conditions. For example, if the borrower makes on-time payments for a certain amount of time, you can request a release. Take advantage of this opportunity as soon as possible. Even if you expect the borrower to continue paying, it’s worth getting off the loan so that you can free up your income—just in case. Plus, accidents and sickness might prevent an otherwise dependable borrower from making payments.